As founder of Executive Speaking Success I’ve traveled hundreds of thousands of miles to deliver professional communications training. Sometimes, when you travel non-stop for a living, it all seems to blur together into one long trip. Recently, however, I undertook an epic and memorable journey with my brother, Mike Bates. He is the founder and CEO of the Salt Lake City-based software company HotWax Systems. Our mission was to deliver professional communications training to the HotWax Systems team members located in the company’s Indore, India office, which houses mainly HotWax Systems developers and business analysts. It was a journey unlike any other in many ways, not only because of what I was able to teach, but also because of what I was able to learn. And of course, being able to share my best offerings to make a difference for my brother’s team made it even more meaningful. 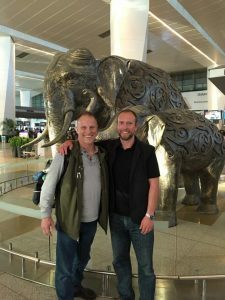 It felt like my journey to India had already begun as I left the training I had just conducted for Boston Scientific, jumped into the rental car in Dallas, Texas, and stomped it for Houston and the three day training I would lead for AirLiquide. I hoped the same rain that had grounded my plane flight wouldn’t be washing me away. As I led the event in Houston I was constantly stressing about whether the planes would be flying by the time I needed to rush back to my home airport of Burbank, California. There, I would have less than 8 hours to kiss my wife, pack, sleep, and then leave for Salt Lake City to meet up with my brother for the rest of our journey. The weather cooperated and I made it to SLC, where I met my brother, Mike, in the Delta SkyLounge. From SLC, we took off for Amsterdam, where we met HotWax Systems CTO Jacopo Cappellato, a lean Italian who is hilarious, mostly on purpose. From Amsterdam we all three took off for Delhi, India, and then finally continued on to Indore, India. It was a great feeling to arrive in Indore, the largest city of the Indian state of Madhya Pradesh, and find smiling, friendly faces waiting for us! HotWax Systems COO Anil Patel was there to pick us up and take to the wonderful Sayaji Hotel. After all that travel time it was great to know we were not far from a bed! And, as a bonus, the Sayaji has some of the most amazing customer service I have ever experienced. Here I was in India for the first time. Wow. 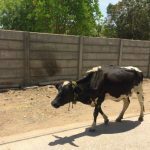 I was pretty stoked to see cows actually wandering in the street here in a city whose metropolitan area is home to almost 5 million people. The traffic was as wild and free flowing, as I had been told to expect and it was 118 degrees Fahrenheit. Of course it only “felt like” 116, due to the slight breeze! The large group training was everything I had hoped for. I felt very honored by the way everyone listened so attentively. I believe that talks have been misnamed. What makes a “talk” powerful is the listening. A “talk” is really a “listen,” which is a good thing to remember when you’re the speaker! The HotWax team members were very engaged and excited. I felt thrilled to be in their new building with them and excited to be able to see where the magic happens and to meet the people who make that magic happen. I was also impressed that the company is so solidly dedicated to providing important training and growth opportunities for the team – I’d find out why, later. I felt grateful that I could speak English here, and be understood so well. The questions and interactions made it clear to me that the entire team were very engaged with the training and were processing and understanding the material. One of the things that seemed to resonate particularly well was the realization that what gets in the way for people, quite possibly more than anything else, is worrying about what others are thinking about us when we deliver a speech or presentation. What works better is to let that go and focus on putting the people you’re talking with at ease–knowing that they’re worried about what you think of them, too–and then focusing on them. This ends up being far better for everyone! After covering some important professional communications principles with the larger group, we worked on one of my favorite exercises, what I call your “Superhero Origin” story, with the management team. (This is an exercise which everyone thinks is going to be a total drag, but which actually turns out to be very inspiring and lovely.) People shared one or two of the key moments that led to them being at HotWax. It put the group back in touch with their real passions and reasons for what they are doing and where they are doing it. Ultimately, it was a great team-building experience. I certainly got the sense that the upper management layer of HotWax is grateful for what seems to be an unprecedented opportunity for many of them. They are not typical in how they got there. The main theme was one of redemption and renewed focus. Everyone had experiences which ultimately gave them great appreciation for their opportunities at HotWax. It was clear to me that they don’t take it for granted. And that is always inspiring. I was very touched by the many stories I heard about people who are inspired by what they do and I was particularly inspired by the conscious way the HotWax Indore office gives people a chance to have a great job, make a good living, care for their families and be able to STAY CLOSE to their families. That was particularly moving for me. Anil Patel brought many of us to tears as he spoke about his experience doing the opposite; leaving his family. Because there had not been good opportunities for him in India he ended up coming to the US and working very hard to establish himself. His goal was to one day bring his father to the US and to take very good care of him. His father had raised Anil as a single father and Anil wanted dearly to repay the favor, but unfortunately his father died just before Anil could make that happen. His father was still young, it was very unexpected and Anil was heartbroken. 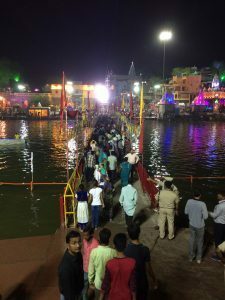 This experience forged a deep desire in him to create local opportunities in Indore that would allow families to stay together while prospering. That dream was realized, and is now the HotWax Indore office. Along with teaching professional communications skills to the team members in Indore, and learning much from them as well, I also enjoyed attending a Cricket match. It was fun and inspiring to see the families and new babies, to hear the stories, and to experience a little bit of life and love beyond work, with the people who work at HotWax. Of course, I didn’t have any idea what was happening in the Cricket match. I would, however, sneak looks at Anil and Jacopo and my brother and I couldn’t help noticing the obvious joy they felt at seeing the wives and husbands of the HotWax Indore team members; at meeting the new babies and hearing about the new houses and at watching their employees thrive. The bottom line for me is something that I learn over and over in all kinds of places, from Salt Lake City to Indore to Bratislava to Santa Monica and beyond: Human beings are human beings. Below the layers of upbringing, culture and geography there is a shared experience of what it means to be a human being. We love to know about each other. When you tell your stories well, and with the intention of opening something up and connecting with people, you’re giving us what we want more than anything: a real human connection.